In Part 3 of this series we discussed Manuscript B of Story of a Soul, the mystical charter of the Little Way, where Thérèse came to recognize her vocation as love. In the Body of Christ she would be the heart. Having discussed the spirituality of the Little Way, in this post I want to turn to practical matters. How do I, practically speaking, follow the Little Way? Most of the material relevant to the practice of the Little Way can be found in Manuscript C, the final two chapters of Story of a Soul. 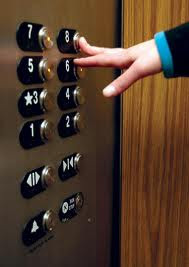 We are living now in an age of inventions, and we no longer have to take the trouble of climbing stairs, for, in the homes of the rich, an elevator has replaced these very successfully. I wanted to find an elevator which would raise me to Jesus, for I am too small to climb the rough stairway of perfection. You know, Mother, that I have always wanted to be a saint. Alas! I have always noticed that when I compared myself to the saints, there is between them and me the same difference that exists between a mountain whose summit is lost in the clouds and the obscure grain of sand trampled underfoot by passers-by. Instead of being discouraged, I said to myself: God cannot inspire unrealizable desires. I can, then, in spite of my littleness, aspire to holiness. Refusing to give up her aspirations to holiness, and despite the daunting climb before her, Thérèse set herself the task of finding an elevator to Jesus. And thus was born the Little Way. "The second commandment is like the first: You shall love your neighbor as yourself." Ah! Lord, I know you don't command the impossible. You know better than I do my weaknesses and imperfection; You know very well that never would I be able to love my Sisters as You love them, unless You, O my Jesus, loved them in me...Your Will is to love in me all those You commanded me to love! Yes, I feel it, when I am charitable, it is Jesus alone who is acting in me, and the more united I am to Him, the more also do I love my Sisters. So, how does all this look in practice? There is a pretty large literature that unpacks, systematizes, and interprets the Little Way. I've read very, very little of this literature. So for my part I will simply gather stories from Story of a Soul that show Thérèse practicing the Little Way in her day to day life. These stories show Thérèse demonstrating little acts of charity and self-mortification. Let me first, however, say a word about self-mortification and its relation to charity and the Little Way. Thérèse was a Catholic monastic. Consequently, self-mortification was part and parcel of her spiritual walk. But self-mortification often doesn't sit well with many Protestants. More, we don't understand it's relationship to love. This is, in fact, one of the acts of self-mortification Thérèse mentions in Story of a Soul: "I don't hasten to the first place but to the last." Love is nourished only by sacrifices, and the more a soul refuses natural satisfactions, the stronger and more disinterested becomes her tenderness. Charity consists in bearing with the faults of others, in not being surprised by their weaknesses, in being edified by the smallest acts of virtue we see them practice. It is no longer a question of loving one's neighbor as oneself but of loving him as He, Jesus, has loved him. I want to be charitable in my thoughts toward others at all times, for Jesus has said: "Judge not, and you shall not be judged." On the other hand, imperfect souls are not sought out. No doubt we remain within the limits of religious politeness in their regard, but we generally avoid them, fearing lest we say something which isn't too amiable. When I speak of imperfect souls, I don't want to speak of spiritual imperfections since most holy souls will be perfect in heaven; but I want to speak of a lack of judgment, good manners, touchiness in certain characters; all these things which don't make life agreeable. I know very well that these moral infirmities are chronic, that there is no hope of a cure, but I also know that my Mother would not cease to take care of me, to try to console me, if I remained sick all my life. This is the conclusion I draw from this: I must seek out in recreation, on free days, the company of Sisters who are the least agreeable to me in order to carry out with regard to these wounded souls the office of the Good Samaritan. A word, an amiable smile, often suffice to make a sad soul bloom...I want to be friendly with everybody (and especially with the least amiable Sisters) to give joy to Jesus. This is the practice of the Little Way, or a central part of the practice. It is to seek out "the imperfect souls" in our lives (I'm sure people are coming to mind) who we generally, along with others, seek to avoid. As Thérèse describes, these people are touchy, irritable, and generally lacking in social graces, among other faults. More, these faults are chronic, personality-based issues that aren't ever going to change (get "cured" to use Thérèse's word). The Little Way is to see these souls as "wounded" on the side of the road and to respond to them like the Good Samaritan. Or, to use Thérèse's other image, we can see these souls as chronically ill and respond to them like a Mother caring for her child ("I know that my Mother would not cease to take care of me, to try to console me, if I remained sick all my life"). Practically, this means we seek out the company of these individuals. And finding them we offer kindness and friendliness. That's a great phrase. "We don't have any enemies in Carmel, but there are feelings." I'm sure you can relate. "I don't have any enemies per se at the office but there are, well, feelings." Those feelings are the focus of the Little Way. And we see the central theme again: Overcoming natural attractions and aversions to seek out the one who isn't an object of affection. I'm particularly struck by how Thérèse compares social avoidance--taking "detours" in order to avoid annoying people--as a from of social persecution. Goodness, I can identify with that. The avoiding people. The "detouring" around them. The Little Way challenges this natural impulse of mine. And it help me see that seeking these people out and spending some time in friendly conversation is a way I might respond to the Parable of the Good Samaritan in my day to day life. I don't have to wait to find a bloody body in a ditch to act like Jesus's model of love. I can do something "little" but just as heroic this very day: I can stop taking those detours and thereby crack the bubbles of social persecution in my workplace (or anywhere else). One day at recreation she asked in almost these words: "Would you tell me Sister Thérèse of the Child Jesus, what attracts you so much toward me; every time you look at me, I see you smile?" A couple of observations about this example of Thérèse's own practice of the Little Way. First, we again see the seeking out of a person who Thérèse found "very disagreeable," and pretty disagreeable across the board--personality, manner, speech. Second, Thérèse moves beyond prayer to focus on actions, doing good things for this person. Third, we see patience and restraint in interacting with this Sister, Thérèse watching her words, keeping a smile on her face, and sometimes changing the topic of conversation. Finally and most importantly, the Sister noticed! This isn't love in the abstract. Thérèse's behavior made an impact. I'm sure many of you are starting to shake your heads. "There is no way," you're likely saying, "that I'm going to seek out and be friendly with [insert name of co-worker, family member, etc.]." Hey, I'm right there with you. I think we're continuing to see how these "little" things aren't so little. And why Thérèse ended up becoming saint for choosing to live this way. I am going to recount certain little struggles which will certainly make you smile. For a long time at evening meditation, I was placed in front of a Sister who had a strange habit...This is what I noticed: as soon as this Sister arrived, she began making a strange little noise which resembled the noise one would make when rubbing two shells, one against the other. I was the only one to notice it because I had extremely sensitive hearing (too much so at times). Mother, it would be impossible for me to tell you how much this little noise wearied me. I had a great desire to turn my head and stare at the culprit who was very certainly unaware of her "click." How awesome is this!? And can't you relate? Boy, I can. I often find myself in moods where people irritate me, for no good reason. I don't like the sound of their chewing. The way they are clearing their throat. The way they are standing too close to me. Ever have one of those moods, where little things people are doing are just driving you crazy? I searched for a way of [listening to the noise] without annoyance and with peace and joy, at least in the interior of my soul. I tried to love the little noise which was so displeasing; instead of trying not to hear it (impossible), I paid close attention so as to hear it well, as though it were a delightful concert, and my prayer (which was not the Prayer of Quiet) was spent offering this concert to Jesus. How to summarize the spiritual heroism of the Little Way? Think of it this way: You can run off to a monastery or hit the mission field or, wait for it, start mastering your irritation. In comparison this last seems, well, pretty little. But upon reflection, each of these seems pretty damn heroic. That's the genius of the Little Way. Finding the experiences of day to day living to be locations of epic spiritual struggle, the narrative arch of the great saints and martyrs. And yet, this is so hard to see. Because let's admit it. Who thinks mastering your irritation, say, standing in line at Walmart is your St. Francis or Joan of Arc moment? Who thinks putting up with the annoying sound of a co-worker eating potato chips in the break-room is the path to sainthood? And she called it the elevator to Jesus. No, I think you raise a good point. For my part, I think of it least as an "elevator to Jesus" than an "elevator to becoming like Jesus." And I think Thérèse thought of it both ways. Taking her to Jesus and making her like Jesus. Mastering my irritation!!! Elevator to becoming like Jesus!!! Want a challenge? Well, how about learning to see Jesus in a chewing-gum popping, aging Valley girl yakking in the library reading room or seeing Him in Glen Beck giving a history lesson? Almost as bad as shanking off the first tee. No Jesus in that. Jesus, Richard! I deal with someone who has chronic personality-based issues, although not every day thank God, and she's not family. I go round and round with myself because all my instincts tell me to "put her in her place" when she goes into her act, which wouldn't do either of us any good. Your post today was something I needed to read. Thanks. "The Little Way is to see these souls as "wounded" on the side of the road and to respond to them like the Good Samaritan. Or, to use Thérèse's other image, we can see these souls as chronically ill and respond to them like a Mother caring for her child ("I know that my Mother would not cease to take care of me, to try to console me, if I remained sick all my life")." How true. People would be much happier and more compassionate, and less bitter and vengeful, if they thought of their enemies as sick rather than evil. Our failure to see others as broken and sick - JUST AS WE ARE - but instead as wicked and evil, can easily allow us to see them as beyond redemption... as if God can "reach" us but not them. It then leads to the sadly "Christian" viewpoint that believers are somehow better than others, and thus "deserving of God's grace" - a contradiction in terms if there ever was one. Hi Richard (and others)! I’ve been reading and enjoying this blog for a while now, though this is my first time commenting. As a Catholic, I’ve particularly liked this series. I’ve seen St. Therese quoted a 100 times, but I’ve never had the chance to read Story of a Soul, and I’ve been struck by its simplicity yet surprising difficulty. I also love her quirkiness and unintentional humor. While I’ve found myself generally inspired by and in agreement with the Little Way, there’s a counter-thought running through my head that I was hoping people here could help me address and synthesize: What if you’re being taken advantage of in a relationship? There seems to me a difference between bearing with a person whose traits irritate you on one hand and bearing with a person who consistently uses the fact that you make an effort to bear with them as an opportunity to take more from you on the other. (While writing this it occurred to me that characterizing someone this way likely already reflects a failure to "hasten to search out her virtues, her good intentions...") At any rate, it seems obvious that if relationship is broken to the extent that serious harm is being done then yes, it should be ended or the problem confronted in a direct way. But in keeping with a theme of this series, what if it is in little, less blatantly harmful ways? (Sorry, I couldn’t resist :) I’m a pretty non-confrontational person, so I think my fear comes from the thought that I’ll attribute my patience to love when a lot of my motivation for it comes from my fear of conflict. Yes I think the "just as we are" is key to this, also keeping in mind that God might be working on something else with them in their lives just now and that what irritates us in them might be a low priority to God (or maybe not a priority at all! - maybe its us and our perspective of them thats sick), or (sorry my mind does this sometimes) they might be like Ruby (the horse who turns out is actually an angel working for good) that behaves in ways that gets Old Diamond (the old horse) very irritable with Ruby - in George Macdonald's "At the Back of the North Wind" (chapter XXXII). "maybe its us and our perspective of them thats sick"
Most likely in fact. Thanks for your insights Al. Hi John, Great question, I don't have any answers to your particular question, but you've set me off thinking that Jesus seemed to get irritable (to say the least) with some people e.g. the money changers who he cleared out of the Temple, and with the pharisees .... so maybe its not always appropriate for us to do the remaining calm type of mastering our irritation, but to express/ master it in a range of Christlike ways! ? Almost universally in Christian circles, those who are routinely damaged in relationships get preached at by third parties that they should "forgive." Unfortnately, what this often means practically is that the wrongs done to them are dismissed under the demanded forgiveness, never acknowledged, and the perpetrator keeps his or her license to continue inflicting damage in a sanitized cyle of abuse. But it seems to me that forgiveness is supposed to be asked for by the one who acknowledges they need it, and in the absence of that acknowledgement, boundaries are not only prudent, but essential. I came across this quote from Therese a couple of years ago. Balm for the soul of this recovering perfectionist. I'm having "one of those days" when it's a good thing that the source of my irritation is not in close proximity. This post has caused me to reflect, prayerfully, on the way I will choose to respond. You raise a great point. I don't think the Little Way as Therese describes it can be picked up and dropped within an exploitative or abusive context. And we also should remember that she lived in a monastery that had a whole lot of structure. So I think we need to think of the Little Way, if exported to very different contexts, as something that is flexible and adaptable. For me, the thing I take away from the Little Way is to focus on my moment by moment reactions to people and situations. To push against my natural aversions. To be kinder, more patient. To talk with someone or do something nice for someone whom I wouldn't normally or naturally seek out or be with. This is an important discipline for me. What I called in the first post "micro" or "little hospitality." Assuming Christ was the innocent Son of God. What act of evil could be worse than to do to Him what was done to Him? Yet, the Bible tells us that it was God's design. God was taking His wrath out on the innocent Christ. This makes God evil and brutal. Why must the Father have innocent blood in order to forgive other people for their crimes? 2) The God of the Bible allowed and planned the murder of His innocent Son. You should read Rene Girard. "It is one of the poorest of human weaknesses that a man should be ashamed of saying he has done wrong, instead of so ashamed of having done wrong that he cannot rest until he has said so." I love the transposition from the wounded Samaritan to the irritating neighbour. I count myself blessed to be married to the person most like Therese that I know in this regard. But I won't elaborate out of respect to those she seeks out to bless, just thank her for all she teaches me. I also liked your take on winning every argument. This morning I continued to read the story of Donal Grant who "had marked the great indifference of the Lord to the convincing of the understanding: when men knew the thing itself, then and not before would they understand its relations and reasons!" Another great post, Richard. Thank-you. Wonderful post, Richard. I can't think of anyone in my life currently who irritates me to any great extent (my current situation is pretty isolated), but in a smaller (littler?) way, I can see changes I need to make. Thanks for making me aware of this book, too. I've just bought it and I'm really looking forward to reading it. frustrated when I run into complexities where it doesn’t fit. confronting problems in a way that’s firm yet ultimately rooted in love. I'll look into it. I'm also going to look more into Christus Victor. I also wanted to say something else here about love. There are no arguments for objective morals. Despite this and all the differences among us there is still a way to discover some goods. One of these goods is love. This seems to be found in our experience. So, with this good we can develope this moral principle: Persons should always do good and avoid and prevent what is bad. Ripping your innocent Son's flesh to shreds and bruising him and hanging Him on a cross isn't good. We may say that our sins were imputed to Christ in such a way that the punishment was just. But if our sins become His and His righteousness becomes ours then we are no longer sinful and He is no longer righteous. But if this is not what is meant then God was punishing an innocent person. This isn't justice. For justice is giving somebody what they deserve. A relative of mine has Borderline Personality Disorder with severe insecurity and manipulation issues. If I give myself to this person in the way Therese describes, there will be nothing left of me for anyone else. For my own mental health and the well-being of my family I must set firm boundaries with this person and limit our time with them. The littlest things can be the hardest things to do.